30 minutes before grilling, remove the steaks from the fridge, pat them dry, and season them with a heavy salt. Arrange them on a wire rack and place them back in the fridge. Clean and oil your grill grates and prep your grill, with all burners to high, with the lid closed. Wrap the wood chips in foil and place to one side of the grill, allowing the smoke to start forming. After 10 minutes of heating, reduce the temp of 2/3 of your grill to low, leaving one of the burners still on high, with the wood chips over it smoking. Mix the turmeric, ginger, garlic and a pinch of pepper in a bowl. Right before cooking, rub the steak with the ground turmeric mixture on both sides. Have the grill hovering over 250 degrees. Place the steaks on the grill over the cool side and allow to "smoke" for about 15 minutes, flipping once. Temp the steaks with an instant read thermometer for 10 degrees below your desired temperature. When temped, quickly transfer the steaks to the smoking hot part of the grill and finish them off with beautiful sear marks, about 1 1/2 minutes per side, rotating 45 degrees halfway through each. Meanwhile, grill the bok choy until just charred. In a grill safe pan, heat the oil until just smoking. Add the mushrooms and saute. Add in the soy sauce and toss the bok choy in the pan with the mushrooms to coat. 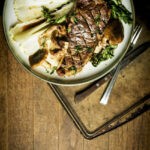 Serve the bok choy on platters, with the steaks atop, and mushrooms over them. Drizzle with the heated soy sauce and garnish as desired.